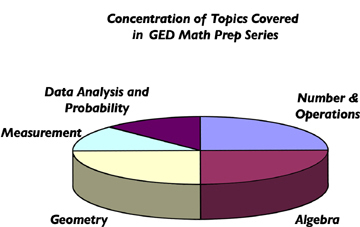 An award winning team of math educators developed the GED Math Prep series on DVD, containing over 75 worked examples which will guide students through the process of learning how to work problems similar to those on the GED. In all, this comprehensive series contains over 10 hours of instruction plus over 300 pencil and paper practice problems. Sample problems include set up questions which encompass approximately 25 percent of the GED exam, problems demonstrating the use of a scientific calculator, graphic questions using pie charts, bar graphs and tables, and more! Problem solving, test taking skills and underlying processes are woven throughout the 5 sections of the series. Also available is a study guide which provides a place for students to document and reinforce lessons and offers additional pencil and paper practice problems. This study guide also contains the official math formula page given during the GED test, a math glossary and test taking tips.